At Diane Michelle Cakes, we love all cakes, big and small, simple or intricate. After our initial communication, we’ll begin the process by gathering information about your event. If you want just a simple non-themed birthday cake, a quick correspondence will work. If you are looking for something more bespoke, we’ll discuss the essentials such as theme, number of guests, and budget. Then Diane will sketch out a few design options and we’ll go from there. Your cake should not only look beautiful, but taste equally delicious. Please check out all of our flavor options here. You can select your own combinations or choose from our recommended flavor profiles. Each 3″ tasting cake we create especially for you is $15.00 and must be paid in advance. You can choose as many or as few as you’d like to taste; we generally recommend three. For orders over $300, the cost of the tasting cakes will get deducted from the final cost of your cake. Please allow thirty minutes to an hour to meet with us. Feel free to bring with you inspiration of any kind; Pinterest boards, color swatches, or photographs. Although we love meeting your extended family and entire bridal party, we recommend only two to four people attend the tasting. Kindly let us know in advance so we can plan accordingly. Whether you are looking for a basic buttercream birthday cake or a sophisticated six-tiered cake complete with sugar bows and baubles, we will try our best to accommodate your request. Below is our general pricing guidelines for both the simple and intricate. 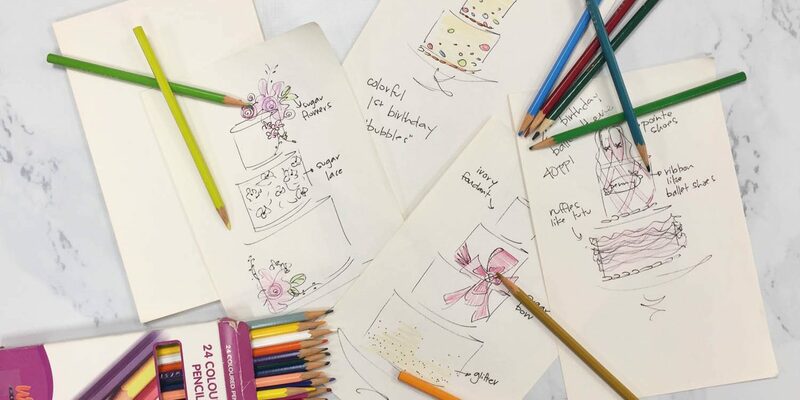 All of our designs are custom-made exclusively for your event. The price of your cake reflects the size, complexity (intricate details and time it takes us to craft) and flavor of your cake. Tiered buttercream cakes start at $3 per serving and fondant covered cakes start at $6 per serving. Starting prices are based on basic cake flavors and minimal design. There is a minimum order of $200 for wedding cakes. This includes a one-tier simple (non-themed) buttercream cake design with buttercream decoration. Cake flavor and colors of your choice. We can further customize your cake with sugar decorations for an additional charge. Please visit the Buttercream Cakes in Gallery for examples and more information. If you would like us to make your cake, a deposit of $100 is required to secure your date. This is non-refundable or transferable and included in the cost of the final cake. Once the design is finalized, a 50% deposit is required upon booking and the balance is due 2 weeks before your event date. Delivery charges are calculated according to mileage and the time it takes us to deliver and set up the cake. We have a variety of cake stands and glass vessels that can be rented to accompany your cake or dessert table. The price to rent each item varies from $25-$40, with an additional refundable security deposit, in case of loss or damage. Please inquire further to see our collection.